2017 was the first year in my twenty-four years of life where I hit every single one of my new year resolutions. It wasn't because I was super disciplined, or because I set simple goals. It was because this year I had one amazing tool that helped me stay motivated, keep organized, and make my goals my baseline for every single day. I'm talking about PowerSheets. If you've never heard of PowerSheets, let me give you a quick rundown. If you have heard of them, stay with me... I'm going to show you how to make the most of them so you can make 2018 your best year ever. PowerSheets is a goal planner designed by the Cultivate What Matters team. They aren't planners in the typical sense, they have no monthly calendars or weekly dates, but it's more like a workbook designed to help you decide on your goals and make them intentional through the entire year. You can order One-year dated PowerSheets or 6-month undated PowerSheets. Depending on when you'd like to start. The 6-month PowerSheets are almost the same as the yearly... just cut in half. The One-Year version has some extra seasonal pages to help you with your goals. Each PowerSheet Planner comes with "prep work" which will help you set the perfect goals and decide on what you want to focus on each day. You can do this in one sitting or 60 sittings! This is YOUR workbook. Each month you'll have a couple prep worksheets to help you get started for the month, then you can write your goals on your tending list. Your tending list is perforated so you can pull it out and keep it on your desk, fridge or in your planner. It's meant to be used every day! PowerSheets are about progress, not perfection. They don't help you make it all happen, they help you make the RIGHT things happen. How Do I Use PowerSheets In My Day-to-Day Planning? I love Google Calendars for planning and reminders, but I'm also a paper person. I remember things better when I physically write notes out. That's why I love using the PowerSheets, a planner, and Google Cal to help me plan. I start out each month with the PowerSheet prep work to help me focus on my goals and decide what is important for the month. I fill out my tending list to keep track of my goals and then I open up Google Calendar to see what events I have going on during the month. This is where my paper planner comes into play, I physically write out all my events for each week every Sunday night. It might seem redundant, but for me, it gives me the chance to review my plans for the week and figure out how to work my goals into each day. Intentionally planning my daily calendar and goals each week has helped me to reach more goals this year than any year in the past. Can't I use a regular notebook to do this? Of course! The Cultivate What Matters team posts a ton of tips and tricks on their blog to help you reach your goals through the year. The PowerSheets just put all that helpful info into one simple workbook for you. Personally, I LOVE this company and I try to support them by purchasing their goodies. Plus something about purchasing this goal planner, helps me stay a bit more accountable for my goals. If you're on a budget or just want to do things on your own, you can find everything you need here. What do the 2018 PowerSheets Look Like? PowerSheets help you uncover purpose-filled goals and plan action steps to make what matters happen. Perfect for anyone—moms, students, creatives, entrepreneurs—who needs a grace-filled system that works! 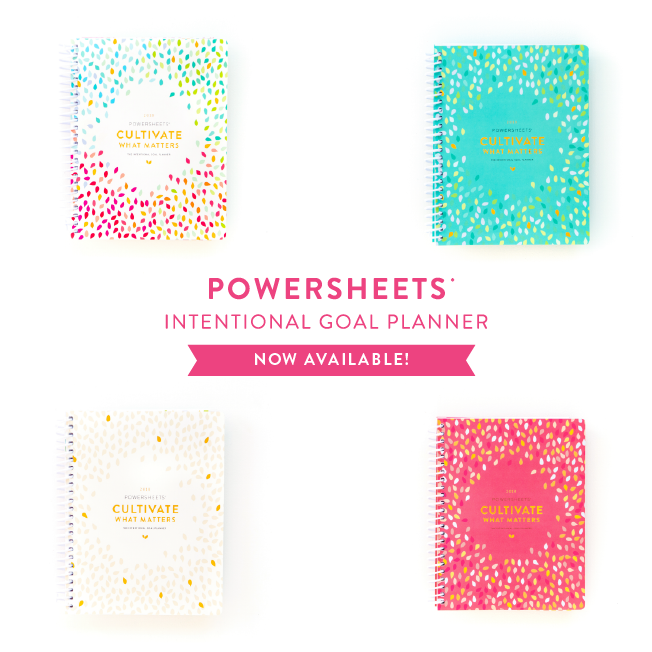 The PowerSheets One-Year Goal Planner features additional seasonal worksheets is already dated by month and includes a full year of goal setting. The One-Year version is in the top left corner of the photo, it comes in the colorful white cover for $55. If you want more color, you can order the 6-Month PowerSheets for $40 which come in Teal, Poppy Pink, and White. Worksheets include the Goal Action Ideas, Monthly/Weekly/Daily Tending Lists, Relationship Tending, Cultivating Gratitude, Big Dreams page for big ideas, What Fires Me Up, Things I Want to Learn/Things I Learned, and more! Every PowerSheet Goal Planner starts with prep work. This prep work is designed to help you narrow in on your goals and create action plans for each one. A goal should be a process of baby steps, not a dream for your life. This workbook helps you turn goals into action plans so that completing them is a day-by-day process. Whether you want to learn a new language, start a business, switch jobs, read 100 books or travel to a new place, this system will help you get there. If you'd like some ideas on how to use PowerSheets, or want a more in-depth look, sign up for the free Launch Party on CrowdCast! The Cultivate What Matters team will walk through the new products and give you a better idea of how to use the PowerSheets. Register for the free Powersheets workshop & Launch party! PowerSheets work, and you're going to feel the impact right away if you're faithful to the process. They will help you prioritize with confidence, giving you more time for what's truly important in your life. But the shop also has more than just the goal planners, prayer journals, books, stickers, and mini workbooks can all be found at their shop (click the banner below)! Let us know in the comments below how your 2017 goals went and what you'll be doing in 2018! Have you used PowerSheets before?